By 2020, nearly 80 million people are expected to have glaucoma, a disorder of the eye that, if left untreated, can damage the optic nerve and eventually lead to blindness. The disease often causes pressure in the eye due to a buildup of fluid and a breakdown of the tissue that is responsible for regulating fluid drainage. Doctors commonly treat glaucoma using eye drops that can help the eye drain or decrease fluid production. Unfortunately, patients frequently have a hard time sticking to the dosing schedules prescribed by their doctors, and the medication — when administered through drops — can cause side effects in the eye and other parts of the body. In what could be a significant step toward improving the management of glaucoma, researchers from the UCLA School of Dentistry have created a drug delivery system that may have less severe side effects than traditional glaucoma medication and improve patients' ability to comply with their prescribed treatments. The scientists bound together glaucoma-fighting drugs with nanodiamonds and embedded them onto contact lenses. The drugs are released into the eye when they interact with the patient's tears. The new technology showed great promise for sustained glaucoma treatment and, as a side benefit, the nanodiamond-drug compound even improved the contact lenses' durability. 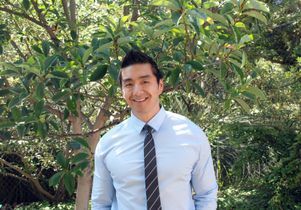 The study, led by Dr. Dean Ho, professor of oral biology and medicine and co-director of the Jane and Jerry Weintraub Center for Reconstructive Biotechnology at the UCLA School of Dentistry, appears online in the peer-reviewed journal ACS Nano. Nanodiamonds, which are byproducts of conventional mining and refining processes, are approximately five nanometers in diameter and are shaped like tiny soccer balls. They can be used to bind a wide spectrum of drug compounds and enable drugs to be released into the body over a long period of time. To deliver a steady release of medication into the eye, the UCLA researchers combined nanodiamonds with timolol maleate, which is commonly used in eye drops to manage glaucoma. When applied to the nanodiamond-embedded lenses, timolol is released when it comes into contact with lysozyme, an enzyme that is abundant in tears. "Delivering timolol through exposure to tears may prevent premature drug release when the contact lenses are in storage and may serve as a smarter route toward drug delivery from a contact lens." said Kangyi Zhang, co-first author of the study and a graduate student in Ho’s lab. One of the drawbacks of traditional timolol maleate drops is that as little as 5 percent of the drug actually reaches the intended site. Another disadvantage is burst release, where a majority of the drug is delivered too quickly, which can cause significant amounts of the drug to "leak" or spill out of the eye and, in the most serious cases, can cause complications such as an irregular heartbeat. Drops also can be uncomfortable to administer, which leads many patients to stop using their medication. But the contact lenses developed by the UCLA team successfully avoided the burst release effect. The activity of the released timolol was verified by a primary human-cell study. 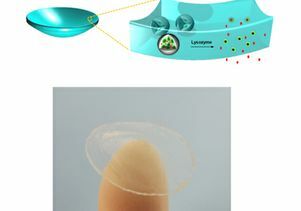 "In addition to nanodiamonds' promise as triggered drug-delivery agents for eye diseases, they can also make the contact lenses more durable during the course of insertion, use and removal, and more comfortable to wear," said Ho, who is also a professor of bioengineering and a member of the Jonsson Comprehensive Cancer Center and the California NanoSystems Institute. Even with the nanodiamonds embedded, the lenses still possessed favorable levels of optical clarity. And, although mechanical testing verified that they were stronger than normal lenses, there were no apparent changes to water content, meaning that the contact lenses' comfort and permeability to oxygen would likely be preserved. Previous UCLA studies have shown that nanodiamonds could potentially be used to address other diseases and disorders, including cancer and osteonecrosis of the jaw. "This discovery represents the pipeline of innovation that is coming from Dr. Ho's team," said Dr. No-Hee Park, dean of the School of Dentistry. "Dr. Ho is a visionary in his field and his advances continue to generate significant excitement regarding the use of nanodiamonds in biology and medicine." Other authors of the study were Ho-Joong Kim, co-first author and postdoctoral research scholar who was previously in Ho's laboratory and is now a professor at Chosun University in South Korea, and Laura Moore, a medical student at Northwestern University, who is also a graduate student in Ho’s lab. The study was supported by the National Cancer Institute, the National Science Foundation, the Wallace H. Coulter Foundation, The V Foundation for Cancer Research, the Society for Laboratory Automation and Screening, Beckman Coulter Life Sciences, and Singapore's Agency for Science, Technology and Research.